If your lawn is spotty or in need of a total replanting, consider planting grass from seed. 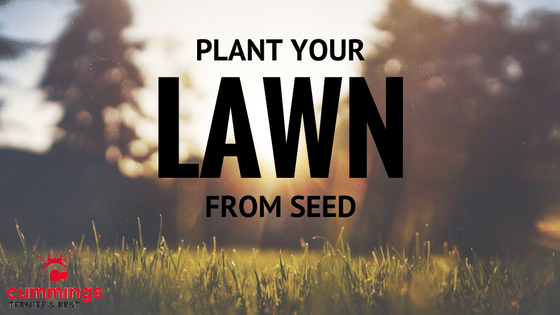 Seeding is more economical than planting sod and seeds are available in a wide variety of grass species so you can choose the one best fitted to your area. Before buying your seeds, check your local watering policies for restrictions that might affect your success. Some areas now restrict how often grass can be watered but may have exceptions for newly planted seeds. Seeds planted in the spring or fall will need less water than seeds sown in the heat of summer. Planting at the right time for your area will make germination faster and your seedlings hardier. Before seeding, consider performing a soil test. You can purchase a test kit from your local home improvement or garden store or contact your local County Extension Service. A soil test will tell you the soil pH and nutrient levels. Till the soil to loosen the top layer and break up any large clumps. For spot seeding, dig the spot and turn over the soil. Remove rocks and rake the area smooth. If you are starting your lawn from scratch, take the time to grade the soil so that it drains properly away from the house. A 1 foot drop every 100 feet is ideal. Remove old sod, thatch and weeds from the area to be planted. If you tilled the lawn, this job is done. Otherwise, pull weeds and remove debris before seeding. Use the results of your soil test to amend the soil before planting. If your soil is heavy with clay, work in a 2-3 inch layer of compost, peat moss, manure or other organic matter. Apply a basic fertilizer with plenty of nitrogen to give your seedlings a head start. If your lawn is St Augustine grass, you will need to fill in with plugs or sod. Other grasses are available as seed. Unless you are starting from scratch, you want to sow the same variety of grass that already makes up your lawn. In the North, Kentucky bluegrass is popular, but may not always be the best choice; in the South bermudagrass is prevalent. If you don’t know what kind of grass you have, take a small sample to your garden supply store and they should be able to identify it for you. If you are sowing an entire lawn, ask them to recommend varieties that grow well in your climate. For a large area, use a mechanical seeder; small areas are easily covered by hand broadcasting. Rake the soil again to lightly cover the seeds and water the area thoroughly. Keep the area moist until the seeds have germinated and grown to approximately 2 inches in height. Water every day, even twice daily in hot dry areas. Once the roots are established, gradually reduce the amount of water given. Wait to mow the new lawn until the grass roots are well established. Wait at least 4 to 6 weeks after planting to apply another dose of fertilizer. Even the best-maintained lawns sometimes get spotty. Sowing grass seed is an inexpensive way to start or repair a lawn. The key to success is to start with a good quality grass seed that grows well in your area and keeps the ground moist until the grass is established.